These are rare late model 5100B's. Near the end of life of these products, Fluke modernized the front panel, changed the style of output jacks, front handles, etc. These units look much more modern and are more reliable than the average unit you will find on the used market. The Fluke 5100B supplies AC & DC voltage, AC & DC current, and resistance for precise applications; such as calibration of digital multimeters. ** NOTE ** - This item may require palletized shipping. Contact Sales for details. Palletized shipments will not calculate properly during online checkout. Fluke 5220A Fluke 5220A Transconductance Amplifier. Up to 20A AC or DC output. 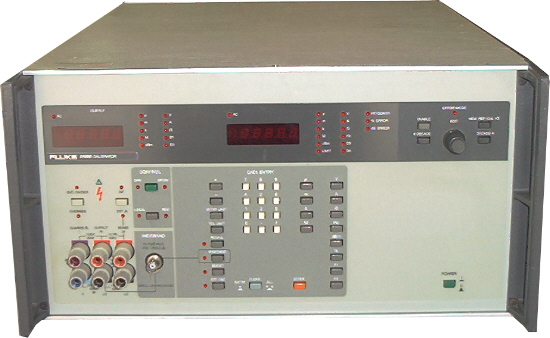 Valhalla Scientific 2555A Valhalla Scientific 2555A AC-DC Current Calibrator Transconductance Amplifier. 100A.